The Arts and Literature Festival of Amritsar invites you to Dramatized Readings on the Partition on Saturday, 9 June 2018 at The Partition Museum, Amritsar at 5:45 PM. 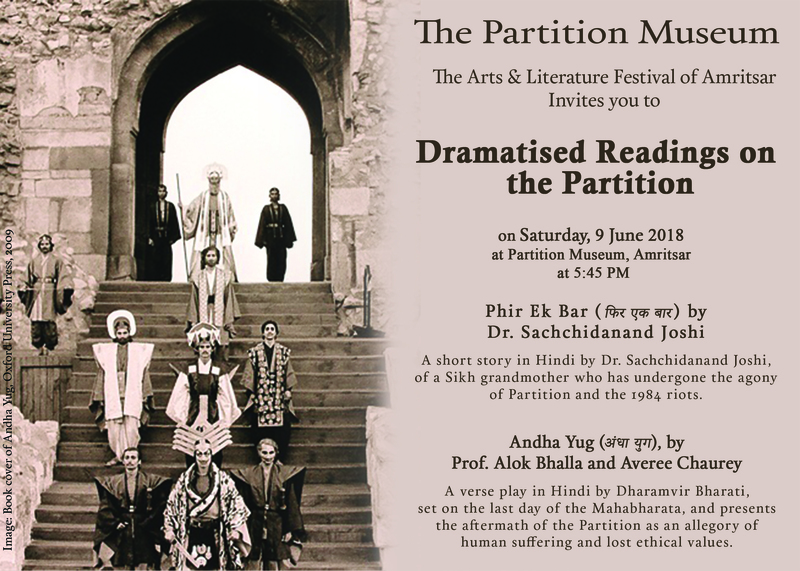 Phir Ek Bar, a short story by Dr. Sachchidanand Joshi, of a Sikh grandmother who has undergone the agony of Partition and the 1984 riots, will be read by the Author himself. Andha Yug, a verse play in Hindi by Dharamvir Bharati, set on the last day of the Mahabharata, and presents the aftermath of The Partition as an allegory of human suffering and lost ethical values. The play will be read out by Professor Alok Bhalla and Ms Averee Chaurey. Dr. Sachchidanad Joshi is the Member -Secretary of IGNCA (Indira Gandhi National Centre for the Arts). He is a prolific writer and poet. He was the former Vice-Chanceller of Kushabhau Thakre Journalism University. He has written several short stories, scripts for television series and plays. Prof. Alok Bhalla was a Lady Davis Visiting Professor at the Hebrew University of Jerusalem, Fellow at the Rockefeller Bellagio Centre (Italy) and Fellow at the Indian Institute of Advanced Study, Shimla. He has taught at Hyderabad University (EFLU), Jamia Millia Islamia and Ambedkar University, Delhi. His publications include Stories about the Partition of India (4 volumes) and Partition Dialogues. His most recent publications include Day and Dastan: Two Novellas by Intizar Husain, and Story is a Vagabond: Fiction, Essays and Drama by Intizar Husain. Averee Chaurey made her mark as an announcer and drama artiste on AIR. In Calcutta, she shot into the limelight with her portrayal of ‘Vasantsena’ in Bohurupee’s production of ‘Mrichhakatika’, and Draupadi in ‘Dharmadharma’. In a career spanning three decades and more than 50 plays, she has worked with directors such as Feisal Alkazi, Habib Tanvir and Amal Allana. Averee has portrayed a variety of roles in films, television and radio and acted in a Bengali feature film ‘Ekti Jibon’, which won the 1987 National Film Award. Currently, she is engaged with productions at the National School of Drama, New Delhi. Join us for an evening of poignant story telling at the Partition Museum. The event is free for all.